“There is no hour composed of equal parts.” From an entire page of text, composed of more than 200 words, these eight words remain, floating cloud-like amidst a blue zigzagged sky. Van Dyke’s original unaltered work eloquently conveys the extraordinary beauty of the desert landscape with precise and passionate observations. Bervin delivers a new narrative that is both conceptually fascinating and visually arresting. And if one is a determined enough anti-redactivist, the stitched-over original text can, by close scrutiny, be deciphered. Meanwhile, the backs of the pages function as something of a mysterious subplot: an all-over textural pattern with hanging threads offers a hint that more story fragments might be lurking within the stitchery. It is an apt and vivid description of Bervin’s work. Missel Romain (Roman Missal), this edition originally published in 1920, is a liturgical book used by priests to celebrate mass according to the Roman rite. 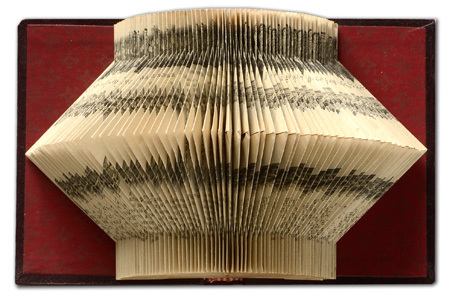 Roger Piottin has treated this book as raw material for the creation of a three-dimensional vase-like object of strikingly elegant proportions by means of a complex folding technique. In the process, the text has been subverted, the evidence of its existence now reduced to dark bands encircling this wholly new object and what little can be seen by peering into the interstices of the folds. 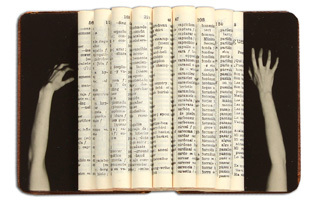 By turning a book into a sculptural object Piottin has made the text, and therefore all the content it conveys, absent. In denying text any active role, he completely obliterates the normal function of a book and shifts attention away from reading and comprehending and toward a re-conception of the book solely as a visual phenomenon. But, complicating the meaning of the book, the artist introduces another medium: the photograph. In this example, the re-configured pages are framed by black and white photographs of a woman’s upraised arms, one to each side, like single quotation marks. The addition of this figural imagery turns the book into an enigmatic ensemble indeed. We might construe the arms symbolically as though attempting to reach beyond the text, grasping for unknowable knowledge. Or perhaps they can be seen as enfolding a cherished text in a protective embrace. However the images may be interpreted, the photographic illusion of volume reinforces the physical volume of the rolled pages.